The Danish Air Force holds an airshow biennially at one of its three main bases. 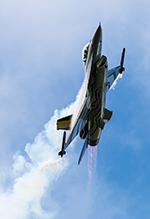 Following a show at Karup in 2014, Skrydstrup - home of the nation’s F-16 fleet - took the mantle this year. With an attendance of 150,000 on the single day, the Danish Air Show once again provided the Danes the opportunity to open the doors to their base, and demonstrate the role that their armed forces undertake. Off-putting for many a photographer at the Danish Air Show was the prospect of a south-facing crowd line, which meant shooting into the sun all day. Luckily, and to their credit, the organisers were aware of this, and planned a Spotter’s Day on the Saturday before the show for 250 enthusiasts. With spaces filling-up within 30 minutes of opening, the event was hotly-anticipated, and for good reason: the Spotter’s Day was everything that could have been asked for, with access into the showground and uncluttered static machines, access to the very photogenic live dispersals, and a most-welcome apportioned piece of real-estate south of the runway to watch practice flying displays. 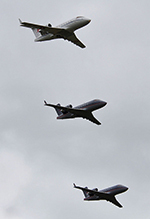 Credit must go to the Danish Air Force personnel who organised the event as the Spotter’s Day was without fault. All this, including lunch provided, for roughly £15.00. As for the show itself, the Danes put on a very polished and well-executed event. As can be found at most military events, there is always a great atmosphere of pride from the military personnel in showing-off their kit to the public; and what kit there was! Every single aircraft type in the Danish Air Force inventory was on show, and nearly every single type was in the flying display. Of particular note, flying from their home base at Aalborg, the Danes managed to have every single one of their 4 CL604 Challengers feature at the show, with three performing several flypasts - including their rare white VIP jet - and the remaining machine on static. 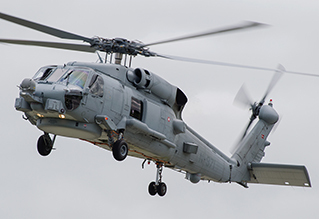 Likewise, the Danes took great pride in demonstrating their newest acquisition, the MH-60R Seahawk, with two of the three recently-delivered models at the show, one in the flying and one in the static. The display was rather tame; understandable, due to the fact that the machines were still full of test equipment, and the crews themselves were quite open about how delicately they were treating their newest of most capable of toys. Skrydstrup, being the home to Denmark’s F-16 fleet, also put some based-machines on show. Indeed, prior to the show the organisers opened a competition for members of the public to design a new special-tail to adorn on two of their F-16s, and a very attractive tail it is. However, in terms of their numbers on the ground, it is felt the home team could have done more. Only one F-16 was on static, which was a ground instructional airframe, and another was a plastic model. In the flying however, the based-machines put on a much better show with a flare-popping solo display using the special-tailed jet, three fighters performing a rather spirited launch before a blink-and-you-miss-it airfield “attack” and flypast prior to landing, and a heritage flypast with the special-tailed F-16 flying in formation with the Swedish-based Spitfire LF Mk XVI. In addition to the extent of home-nation support, it was also in international participants where the Danish Air Show excelled. 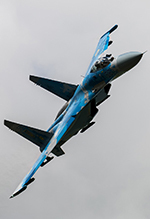 If there was one confirmed participant that got people talking at the start of this year, it was the pencilling of the Ukrainian Air Force Su-27 Flanker display. A rare-enough aircraft of itself, coming from a nation currently at civil war, it was expected that the jet, and its Il-76 tanker support, would drop off the list soon enough as the days and weeks progressed. Indeed, it would have been fool-hardy to place money on its attendance; yet sure enough, come Friday before the show a pair of Flankers - a single and two-seat - along with their Il-76 support touched down on Danish soil after a 3-hour flight from Ukraine. The display was clearly taken from the much-loved displays of old, featuring brutish power-manoeuvres, missed approaches, and on Saturday, an impeccable tail slide manoeuvre. The massive aircraft had a great amount of presence at the show, and for once made the distance of the 230m line (to which the participants were operating) almost immaterial when compared to the much smaller F-16s and Polish MiG-29. Other international participants at the show included the Turkish Stars, putting on as charismatic a routine as can be expected from the Turkish team with their beautiful F-5s, the Hellenic and Belgian F-16s and a much-improved Patrullia Aguila display which felt much slicker than in previous years, lacking the excruciating gaps between passes. There was support from the Swedish Air Force Historic Flight in the form of their J-35 Draken, putting on a meaty and energetic show, as well as a three-ship display from their Sk 16As (Harvards), and a notable appearance from the Czechs with their much-loved Mi-35 Hind display, sporting the rather marmite “Alien tiger” scheme adorned for the NATO Tigermeet held at Zaragosa in Spain earlier this year. In terms of static participation, the organisers made great effort to tow spare aircraft to the static park, including the Hellenic F-16 and the twin-stick Su-27, not originally down on the participation list as present in the static but nonetheless accompanied by a large and enthusiastic group of crewmembers. 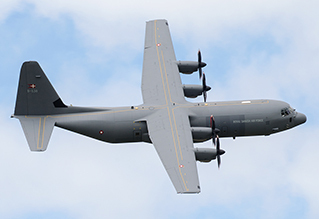 Other notable static participants included an actual airshow appearance by a NATO E-3A Sentry and the Ukrainian Il-76 (including a poster from its attendance at RIAT 2011 inside!) which were both open for tours – with the latter featuring, rather interestingly, an entire spare engine for the Su-27s. 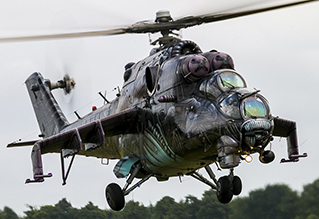 Lithuania also featured in the static with one of their three brand new AS365 N3+ Dauphin SAR helicopters, which will replace their venerable but aged Mi-8s. Making the five-hour flight from Lithuania to Denmark, the type’s unexpected attendance was most welcome in the static park. Other attendees included a US Army UH-60 Blackhawk, a brace of Norwegian F-16s, a Luftwaffe EF2000 (the fast jets all being unannounced beforehand) and a plethora of immaculate historic and museum aircraft. Sadly, the gripe with statics was the conspicuous white-tape barriers and cones, which were tightly packed to the machines, making photography of the quality machines present very difficult. The Danish Air Show at Skrydstrup this year played host so some 150,000 members of the public on Sunday - a gargantuan attendance for a single-day airshow which was, in fact, a record figure in the country. With excellent support from the home nation, and terrific international attendance, this free airshow can be considered in every way a success. 2018’s show sees Aalborg take the mantle of the Danish Air Show, and those personnel at Skrydstrup have set a high bar to surpass indeed.